The round(ish) mark on the bottom of a hand worked glass piece is left by the punty. First gather glass on the end of a pipe. Then blow the glass and shape as desired. At this point the top of the finished vase is connected to the end of the blow pipe. In order to shape the top of the vase, the piece must be transferred to a solid rod called a punty, an “Americanization” of the Italian word pontil (The Italians invented – and named – virtually all modern glass blowing tools and techniques). To transfer the vase, a small bit of molten glass is gathered on the end of the punty. This is used to “glue” the punty to the bottom of the vase. Then water is dripped on the glass near the blow pipe to chill it and cause the glass to crack. With a sharp tap on the blow pipe the vase breaks away from the pipe and is now attached at the bottom to the punty. The top of the vase can now be re-heated and shaped to form the neck and lip of the vase. The punty must be kept hot enough to keep the piece attached, but not too hot or it will fuse too strongly to the bottom of the vase. When the vase is finished, a bit of water or a touch with a metal tool is used to chill the punty exactly where it meets the bottom of the vase. A sharp tap on the punty rod should cause the vase to crack off, hopefully without damaging the vase! The mark that is left where the punty was attached can be fire-polished before the vase is put into the annealler, or “cold worked” later after the piece has completely cooled. 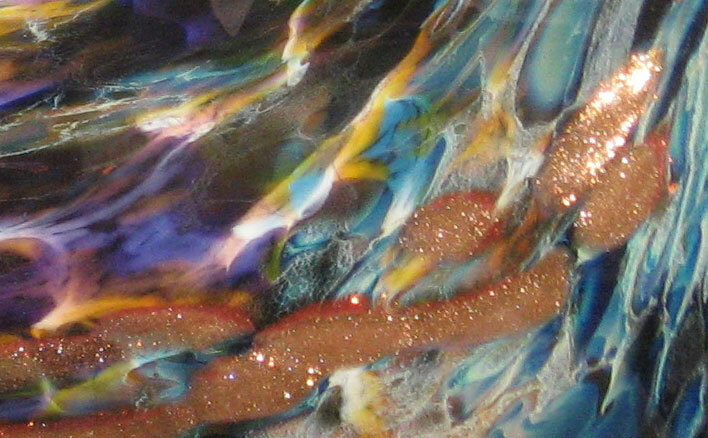 Many glass artists will grind and polish the bottom of their work to erase the punty mark, but I do not. I consider it to be the “belly button” of the piece, which proves that it was “birthed” by hand, not manufactured by a machine. Machine made glass does not have a punty mark because a punty is not used to make a machine blown-piece.